Paul is a fine softball player and a great person. Despite his reputation (the ordeal with Danny Williams at the Cajun in '96), Paul is one of the finest people you'll ever meet. To those who don't know him, he comes across as a typical 'super' pitcher with lots of attitude. He is definitely a competitor, but more than that, he loves the game of softball. I've played with him many times on some of the worst local teams imaginable. We've played on church teams with guys who haven't picked up a bat since they played peewee baseball some 20 years ago. Paul would go out of his way to teach others how to play the game. One person in particular learned how to hit a softball (with Paul's help) over the course of one summer. By the fall, this guy would occasionally hit one out of the 275-foot park. From that point on, Paul would hit his '.800 average patented right field shot' until this guy had an opportunity to hit the ball out of the park. 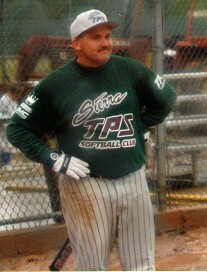 In all, he's a great guy and an asset to the major softball world. Jump back to softball page. This page was last modified on August 18, 1998.